The Reunion in Savannah is over. Plans are in the making for next year's reunion in the Boston area. Please check back in January for all the details. A photos and a brief report from the Savannah reunion is in the October Newsletter. Minutes from the Annual Meeting will be in the January issue. Below and the links to pages for the 2016 reunion are as they were presented prior to the annual gathering. Family Reunion is in Savannah! Savannah, a coastal city in Georgia, is separated from South Carolina by the Savannah River. 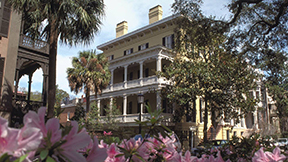 It’s known for manicured parks, horse-drawn carriages and antebellum architecture. Its historic district is filled with cobblestoned squares and parks, such as Forsyth Park, shaded by oak trees covered with Spanish moss. At the center of this picturesque district is the landmark, Gothic-Revival Cathedral of Saint John the Baptist. This excursion in Georgia's "First City" visits all the familiar sites and landmarks of the Historic District as well as "forgotten" neighborhoods. See where history was made, the whimsy and grace of the Victorian District, restoration in the Thomas Square neighborhood, history of the Beech Institute area and the oak lined grandeur of Victory Drive. Lunch at one of Savannah's oldest and most unique restaurants since 1753, the Pirates House. During the day on Saturday, the PDA Annual Meeting is when we will all gather to hear reports and vote for new officers. Expect some interesting and informative presentations on family history following the meeting, and some more free time in the afternoon to explore the city. Details are still being worked on. Saturday evening, we close the Annual Reunion with group photos and the banquet at the Crosswinds Golf Club. The menu includes sesame encrusted Salmon, rosemary roasted chicken, scalloped potatoes, southern green beans, rolls, salad, iced tea and for dessert, pecan pie with vanilla ice cream. Print the poster and post it on your fridge or share with cousins. Like us on our Facebook Page and sign up for our email announcements to be notified when new information is available.